Delacroix’s masterpiece La liberté guidant le peuple , in the collection of Le Louvre, Paris. Providing a rare insight into Delacroix’s creative process, the fast and fluid lines of the final composition takes form with the figure of Liberty at the centre, surrounded by the fallen men who populate the primary plane. A pivotal figure, looking up in hope and admiration, is present to the left in both the preparatory and the final painting. 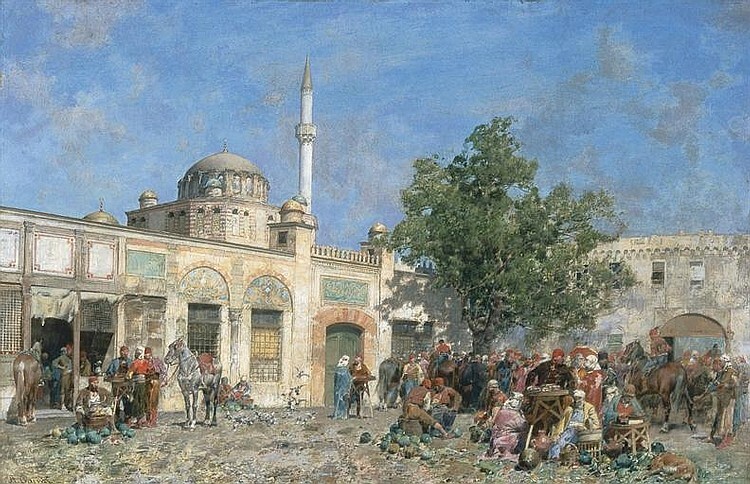 to a bustling street scene, Mercato a Costantinopoli, by Alberto Pasini, circa 1880 (estimate: £200,000 - 300,000).